Amistad's Jaden Ratiff (5) goes past Torrington's Nick Balducci (1) to the basket in the CIAC Division III boys basketball semifinal game between Amistad and Torrington high schools, Wednesday, March 13, 2019, at Wilby High School, Waterbury, Conn.
Torrington, with good size, speed of its own and an ability to light up the nets on any given night, fed off a third-quarter jet-stream in its first two tournament games after a first-round bye. Monday, the Wolves, nursing a 32-26 halftime lead, matched the Red Raiders step-for-step in that crucial period, emerging unscathed with a 44-37 advantage. “We looked at those games and didn’t want to tell anybody, but, all year, we’ve been a third-quarter team ourselves,” Ott said. Torrington’s defense, too, has been effective when they play a helping 2-3 zone. Wednesday, the Wolves managed quick passes and outside shots through the zone, then kept the Raiders from scoring opportunities with in-your-face man-to-man coverage. Despite the stellar qualities Ott ascribes to the Wolves, the Raiders came out looking like the team that would slide easily down to Sunday’s 1 p.m. finals date at the Mohegan Sun with No. 3 Farmington, a 72-53 winner over No. 2 Prince Tech in Wednesday’s other semi. 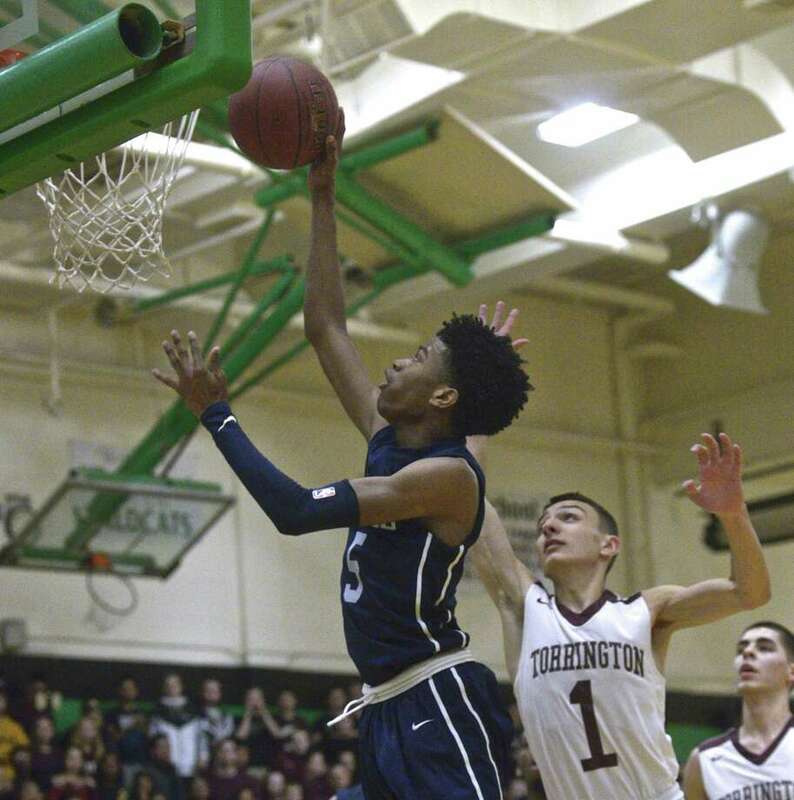 Torrington’s quickness ran out to a 9-2 opening salvo on seven points from forward Ty Davis (17 points) on a pair of drives and a three and a drive by point guard Dontae Thomas (22 points, including four 3s). Then Cyprien Joseph (game-high 23 points, including three 3s), one of the Wolves’ three 6-footers, roared in to demonstrate some of the Amistad qualities with seven quick points. When 5-foot-7 sophomore Eli Blackwell joined him for eight of his 21 game points, the score stood 15-15 at the end of the period. If the Raiders didn’t think they met their match, the second quarter gave them food for thought. Joseph, keeping tabs on 6-4 Torrington center Kevin Dixon for most of the night on defense, went off for nine of the Wolves’ 17 points for their half-time lead. “(Joseph) is an excellent example of our balance and toughness,” Ott said. Still, the Raiders are used to tough first halves. Thomas went to work with a pair of threes in the third quarter. Torrington’s defense held Joseph down to just two for the period. Five-nine Amistad guard A.J. Edwards was ready to show the balance, with eight of his 11 points, including two 3s. Blocked shots and steals stifled the rest of Torrington’s comeback attempts, sinking the Raiders back to a 44-37 deficit into the final period. The Wolves started the home stretch with a steal and the first five points. Joel Villanueva (22 points) had his best quarter with eight points and Thomas hit nine, but it wasn’t enough as Blackwell, Edwards, Isaiah Joyner and Joseph went a combined 13-for-18 from the foul line, led by Blackwell’s 8-for-8. “We got out-physicalled,” Gamari said. Eli Blackwell 6-9-21; A.J. Edwards 3-3-11; Jaden Ratliff 2-0-4; Isaiah Joyner 2-1-5; Cyprien Joseph 9-2-23; Justin White 3-0-7; Totals: 25-15-71. Dontae Thomas 9-0-22; Ty Davis 7-2-17; Joel Villanueva 7-7-22; Kevin Dixon 0-2-2; Brian Ballesteros 1-0-2; Totals: 24-11-65. 3-point goals: A — Edwards 2; Joseph 3; White. T — Thomas 4; Davis; Villanueva. Records: Amistad 18-6; Torrington 19-7.